It was a little after 10 p.m., and several hundred miles off the coast of Massachusetts, Chrissy Hernandez was counting eyeballs. Scattered across a dinner plate-sized sieve in front of her was the harvest from yet another tow with a fine-meshed net. Hernandez, a graduate student in the MIT-WHOI Joint Program in Oceanography, shone a light across the sieve, looking for the telltale shine of larval fish eyes. She was hunting for one species in particular—Atlantic bluefin tuna. Bluefin tuna are the largest species of tuna, growing up to ten feet long and more than a thousand pounds. Their population has been severely depleted by overfishing, as their meat is prized for sushi and can sell at exorbitant prices (one fish sold for more than $1.7 million in Japan in 2013). A key way to help conserve the species is to protect areas where they go to spawn. But to do that, “you need to know where they spawn,” said Joel Llopiz, a biologist at Woods Hole Oceanographic Institution (WHOI) and Hernandez’s advisor. In the Atlantic, bluefin tuna generally split into two stocks, which are managed separately. The eastern stock spawns in the Mediterranean Sea, and the western stock spawns in the Gulf of Mexico. But in the summer of 2017, Hernandez wasn’t in either of these recognized spawning grounds. She was in a third, previously unknown spawning area. It’s tucked into the gap between the continental shelf off the U.S. Eastern Seaboard and the Gulf Stream current as it peels away from the coast—an area known as the Slope Sea. Some scientists had suspected that the Slope Sea could be a potential spawning ground because they had tracked tagged tuna to this location when the waters were warm enough for spawning. But adult bluefin tuna can swim up to 40 miles per hour and the tags aren’t that accurate. The fish could have just been passing through. Then in 2013, larval bluefin tuna were found in several locations in the Slope Sea during a sampling cruise run by the National Oceanic and Atmospheric Administration (NOAA). The discovery of a potentially new spawning location was definitely exciting. But there’s a big difference between finding larvae and showing that these fish grow up to contribute significantly to the bluefin population. The Slope Sea is a very different environment from the other two spawning locations. Could fish hatched there actually grow and survive, or would they all die off? The first few weeks of a bluefin tuna’s life aren’t easy. A female tuna can lay millions of eggs, but only a small percentage of hatchlings will make it to adulthood. The new larvae are tiny, only a few millimeters long, and they are easily swallowed by a plethora of plankton-eaters. Even if they manage to avoid being eaten, an influx of water that is too warm or too cold can kill them as they are swept along by the currents around them. The Slope Sea, which is known for both fluctuating currents and temperatures, is a hard place to survive. Young tuna could also wind up along the continental shelf, where the waters are too cold for survival. On the other hand, some of the currents in the Slope Sea might actually help the tuna larvae. As the Gulf Stream wavers along the Slope Sea’s southern edge, it spins off rotating currents to the north, known as eddies or warm-core rings, that can linger for months. As their name suggests, these rings trap warm water in their centers. If that water is the right temperature, the circular motion could cocoon larvae safely within the Slope Sea until they are able to swim independently. The Slope Sea’s variable currents and fluctuating temperatures makes it a complicated problem to determine if larvae can survive there. Scientists can take measurements of the water temperatures and currents as they study the area, but these only provide brief snapshots of information in one place at one time. 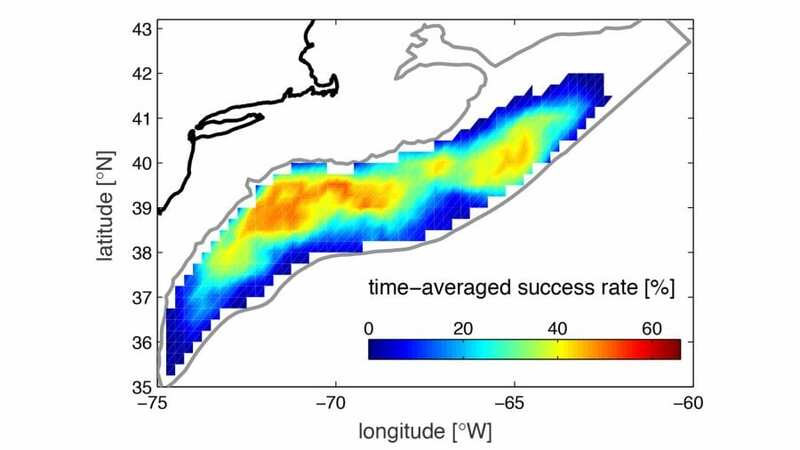 To figure out whether the Slope Sea could be a viable spawning ground for bluefin tuna, the biologists needed a picture of what was happening in the entire area over the course of several months. Fortunately, Llopiz knew people who could build exactly that. A few years earlier, Llopiz had received an email from two physical oceanographers at WHOI, Larry Pratt and Irina Rypina, who were examining another longstanding ocean larval mystery: how American eels get from their spawning areas in the Sargasso Sea to the mouths of Eastern Seaboard rivers where they spend their adult lives. Pratt had seen an article in The New York Times claiming that larval eels simply drifted from the middle of the Atlantic to the coast of Maine. He and Rypina study ocean currents, and they had their doubts. But they were not experts in all the biological factors involved, so they enlisted Llopiz. The trio wound up collaborating on a study using a numerical model of currents in the Atlantic Ocean to investigate this mysterious migration. Since then, they have kept an eye out for other opportunities to combine their skills. Rypina and Pratt study the physics of ocean movements. They focus on models that view currents as an agglomeration of individual particles of water swirling around. 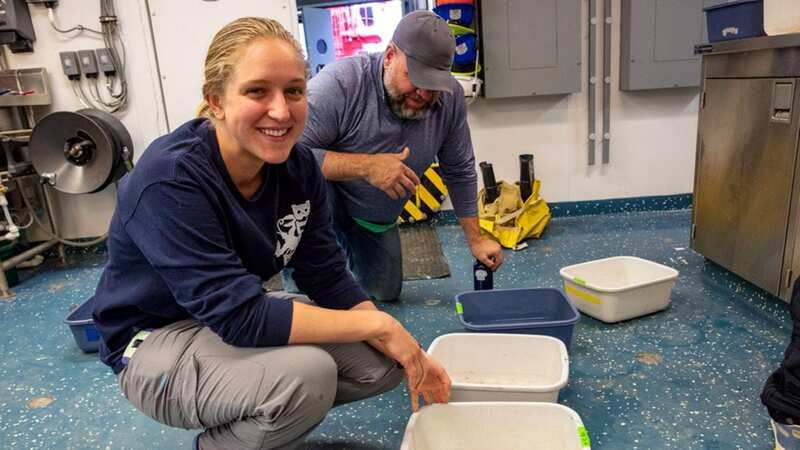 But tuna larvae can also be viewed as tiny individual particles, so “the method for tracking water particles can easily be adapted to track small critters,” Pratt said. To explore the Slope Sea tuna riddle, the team needed a model that focused on that specific region; the model they had used for the eels spanned a larger portion of the Atlantic. For this, they approached Ke Chen, a numerical modeler at WHOI who has been studying the physical processes in the area around the continental shelf in the Northwest Atlantic. Chen specifically works on modeling and understanding currents on the continental shelf and in the Slope Sea, including Gulf Stream warm-core rings. To improve the accuracy of his regional model, Chen incorporates fresh water flowing out from rivers into the ocean and other processes that typically aren’t considered in open-ocean models. Chen adapted and refined models he had worked on before to create a model of water movement in the Slope Sea. He tested its accuracy against actual data collected during the 2013 NOAA cruise. They focused on the factors that would affect larvae the most: temperatures and currents in the top 30 feet of ocean, where tuna larvae are typically found. Once they had a working model ready to go, it was time to release the fish. Virtual fish, that is. As the model replicated the Slope Sea conditions of 2013, the scientists dropped 2,500 “larvae” into the virtual ocean every three hours between May and October and tracked them as they swirled through the currents. Llopiz and Hernandez provided the biological information to decide whether each virtual larva survived. 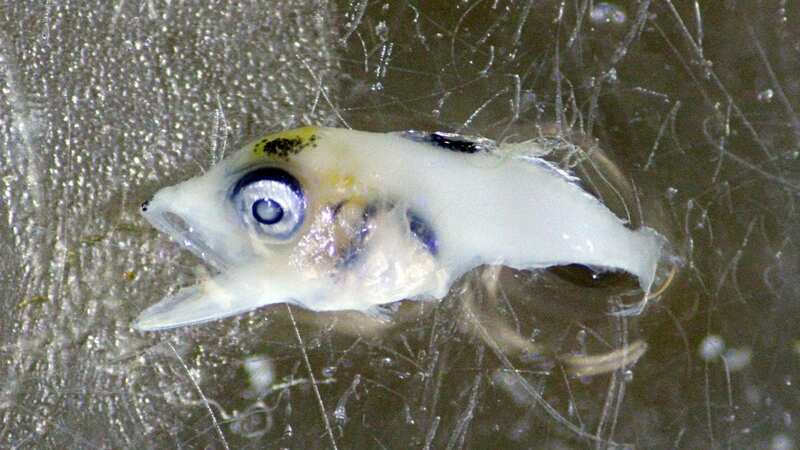 The larvae had to remain in the right temperatures within the Slope Sea for 25 days—an estimate of how long it might take larval tuna to grow big enough to be able to swim independently of the currents. At the end of the model run, the researchers had found two spawning hot spots where tuna larvae had the best chance of survival. These areas were warm enough to support the larvae by the end of July, and the nearby currents kept them within the spawning ground. One was in the southwestern part of the Slope Sea, away from the swirls of the Gulf Stream, and the other was farther north, centered on the place where a warm-core ring was located in 2013. The model identified, on average, the times and places in the Slope Sea where conditions would allow tuna larvae to thrive. The next step was to go out and see if tuna larvae are actually there. Hernandez stood on the stern of a NOAA-operated vessel holding a diamond-shaped apparatus made of canvas and bamboo, known as a drifter. She had found bluefin tuna larvae at the last three sampling locations in the ocean. She held a walkie-talkie in her other hand, coordinating with two shipmates who waited to deploy additional drifters. The drifters plunged into the water, stabilizing a few meters below their buoys at the surface. They would be slowly swept away by the currents, transmitting their locations as they went. 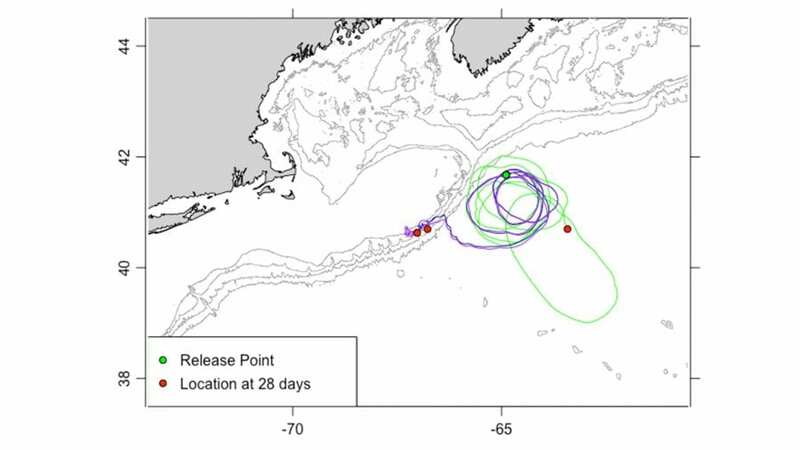 Data from the drifters can help improve and confirm the WHOI physical oceanographers’ models. Hernandez is using the larvae she collected to compare growth rates between the Slope Sea population and those in the Gulf of Mexico. Other researchers are looking at the genetics of the samples she collected to determine whether the Slope Sea tuna are related to the eastern or western stocks. What these scientists learn will be critical for devising effective conservation strategies. The future of bluefin tuna, both in the ocean and in soy sauce, depends on it. This research was funded by NOAA, the National Science Foundation, WHOI’s Ocean Life Institute, and WHOI’s NOAA-funded Cooperative Institute for the North Atlantic Region.